Vertical Form, Fill & Seal ­­– commonly used for industries and products such as cheese, frozen foods, candy, chocolates, seafood, powders, poultry, meat, and more. VerTek 800 & 1200 – These automatic VFS bagging machines are constructed with a single piece 304 stainless steel frame for sanitation purposes. The VerTek 800 can produce up to 8” wide pouches with speed of up to 60 cycles per minute while VerTek 1200 can create up to 12” wide pouches with rates of up to 50 cycles per minute. VerTek 1600 – Ideal for big bag applications, this robust automatic bagging machine can produce pouches of up to 16” wide. Built with a heavy-duty stainless steel frame, it can operate on several film structures such as laminated, metalized structures and polyethylene. VerTek 2400 – The most heavy-duty among the previous models, this VFS bagger can withstand even the toughest and heaviest of filling applications producing pouch as wide as 24”. XPdius Elite i-130 – With a maximum mechanical rating of up to 100 bags per minute, the XPdius VFS bagging machine features twin servo motors, vacuum pull belts, heavy duty one-piece stainless steel welded frame, Lexan doors, and more. R2B Horizontal Form Fill & Seal Bagger is capable of automatically producing, filling, and sealing pouches in various styles using a laminated roll stock film. This automatic bagging machine significantly reduces material cost as it eliminates the need to purchase pre-made pouches. Swifty Junior – A compact and economical automatic bagging machine that opens, fills and seals. Consequently, it will produce up to 45 pre-made bags per minute. Therefore, it is ideal for small to medium production rates. Swifty 1200 – Ideal for larger bag size requirements. This pre-made pouch bagging machine can automatically open, fill and seal pouches with up to 12 inches width. As a result, there is a maximum mechanical rating of 30 bags per minute. 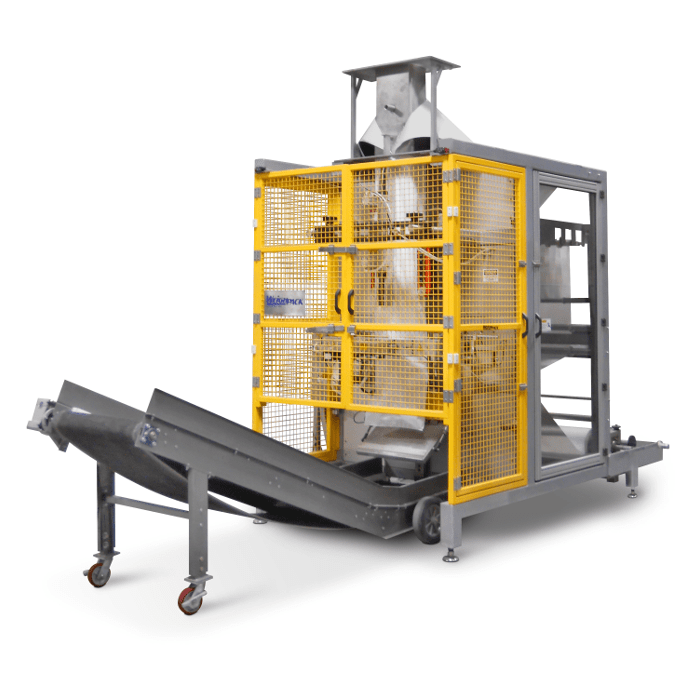 Swifty 3600 – it is perfect for higher production rates that require up to 45 bags per minute. This automatic bagging machine is built to last even the harshest production needs. Bingo Bagger – Designed for filling larger bags. This automatic bagging machine is known for its unique ability to vacuum or gas flash at the sealing station. Also, this makes it perfect for certain packaging types like Modified Atmosphere Packaging. VS Bagger – Built without a sealing section, this bagging machine automatically positions a pre-made bag. Opens it and waits for it to be filled with the product. Once filled, the bagger shifts the newly filled bag to the side and place a new bag under it. Zippy Bagger – Ideal for speeds of up to 35 bags per minute. This automatic bagger can operate on laminated and low-density polyethylene materials. Whether it’s a pillow style or stand-up kind of pouch.